Games Meet Metal: Hey, you got my Killzone mixed in with my Brazillian beats! Hey, you got my Killzone mixed in with my Brazillian beats! Honestly, who in the Roadrunner art department has way too much access to a PS3? 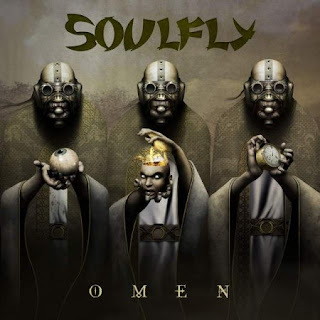 This is the artwork for the next Soulfly album Omen, and if you're not thinking the Helgast, then at least think more Star Wars or those blue-eyed guys form Dune. 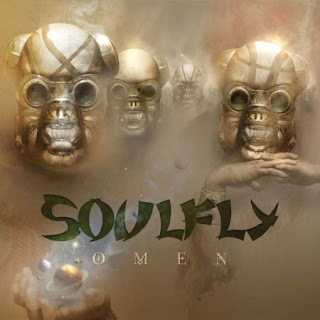 Either way, this is a different approach for Max Cavalera and company, and I'm kind of liking it. Not the best in the world, but not totally bizarre either. Oh, and here's the special edition cover. When did the Borg develop rust? Hey, guess what? I'm a sickly idiot! 8-bit Metal Mondays: Oh Fucksticks, I Forgot! Those two would have a ton to talk about. Um, Ozzfest? Hello? Ya There? Happy St. Patty's Day, Ya Drunks! 5 Quick Hit Reviews From Riff! Oh, Harpo's, what has become of you?